If you’re hosting a Halloween party this year, why not change things up with a unique costume party theme? If you’re a parent of a child that loves all things fancy, then a princess themed costume ball would be a great way for her to celebrate with her friends! At the princess ball, all the little girls in the neighborhood can get together and dress as their favorite fairytale princesses and party the night away in style. Here are a few ideas to help you host a great Halloween princess ball! Set the tone of your Halloween party with your invitations. This party is not about your typical Halloween spooks and spirits, this party is about fun and fairytales! We suggest a party invitation that has an air of majesty to it, because it is, after all, a royal ball. You can find some great custom ones from Etsy from a variety of specialty vendors, or if you prefer an online invitation, you can visit PaperlessPost.com or Evite for some gorgeous designs. You can recreate the ambience of a princess castle with the right décor. We suggest flowers, tulle, pom-poms and candles to transform your home into a fairytale dream. 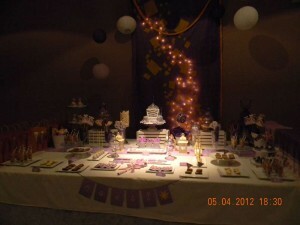 You can visit CatchMyParty.com for some fantastic decoration ideas. We like how this Tangled princess party repurposed Christmas lights to create a dark, yet dreamy mood! 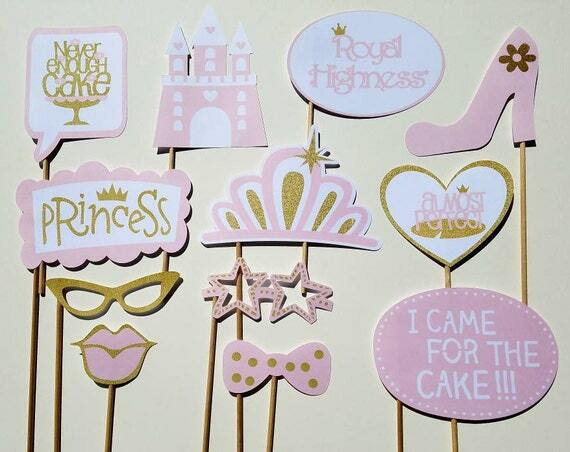 Keep your party guests entertained with some princess party games and activities. You can set up an arts and crafts corner where they can decorate their own crowns and princess wands. Supplies can be found at any local arts and crafts store. Also, since your guests will be dressed in costume, you can stage a runway show and let all the little girls show off their lovely princess dresses! You can also create a backdrop photo booth area where guests can have a photo-op and a keepsake of the night’s events. Every little girl loves sweets and since it is Halloween, you can indulge their sweet tooth just for this one night. We recommend pretty cupcakes or cake pops, light finger foods like sandwiches, and fruits and veggies to add in something healthy. 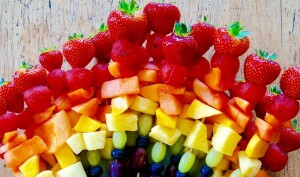 We like how this rainbow fruit kebob adds color to your party while offering nutrition to your young ones! With these great princess party ideas, you can host a Halloween costume party that is fit for royalty! To make your party a true success, you can shop at our website for the best princess costumes around. For more great party ideas and costume ideas, make sure you follow us on Pinterest and subscribe to our blog. Also, leave us a comment if you’ve got a unique Halloween themed party that you’d like to share with us and we’ll catch up with you next time!